The lakes of the Jura’s Mountains (France) fascinate. Austere in winter, comforting in summer. They attract on their banks hikers and poets. What lies under their opalescent glass? What are the forgotten creatures that evolve in these clear waters? With modesty and discretion, Michel Loup dived in these waters to explore the submerged vegetation Now he reveals his most beautiful images patiently collected in the heart of the lakes of his childhood.Page after page, the photographer immerses us in an unexpected landscape, where the magic of reflections and lights is expressed in the course of seasons and meetings. In icy bubbles, wild frogs, pink lilies and silver fish the dive is total and pleasure is absolute. Michel Loup is a professional photographer over twenty years. Although its numerous reportage in countries such as Brazil and Madagascar, he remains faithful to the fascinating mountains of his native land.Water and light are the two main themes of his pictorial universe. 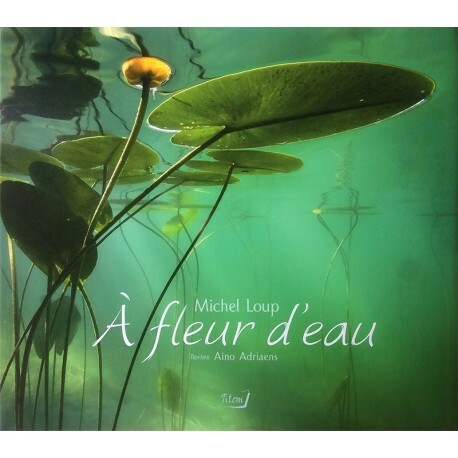 With persistence and patience that comes from years of observation, he captures the ephemeral games of them in the wild places of the Jura’s mountains and its mysterious lakes.The Michel’s attraction for the aquatic environment becomes fascinating when he dives into the strange world of water lilies. Since then, he never ceases to explore the lakes in search of the purity of the "original landscape"
a world away, almost inaccessible, they live strange creatures. To see them you have to cross the mirror and dive in the unexpected. All the photographs in this book were taken with natural light.